Scientists believe that the web probably once looked like this. BARCELONA, SPAIN — An orb spider, dating back 110 million years to the time of the dinosaurs, may offer exciting clues about early porcines, according to a recent report. The spider, which scientists have dubbed Araneus Charlotta, was found preserved in amber, along with a portion of its web. 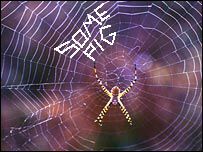 The web, possibly the oldest on record, has led some scientists to speculate that prehistoric pigs may have been vastly superior to the animal we know today. The exact text has been a subject for debate among the team, with some believing it to spell “RADIANT”, others “TERRIFIC”, and some even “HUMBLE”. The current consensus, however is that it says “SOME PIG”. The find dates back to the Early Cretaceous period, a time which was previously believed to pre-date the earliest known porcine species. At the moment, the scientific community is divided over the initial report. Most believe, as Dr. Arable does, that this is a clear indication of an exceptional species of early pigs. Some, however, insist that it’s actually the spider that’s remarkable. Dr. Arable and her team are currently seeking a grant to continue their research. I love this post! You have a great blog here!